ClubCoins Nødvendigt: 100 Please note that, for now, you cannot download content from our platform directly onto a mobile device (phone, iPod, iPad, tablets...). You need to download your items onto a PC or Mac, and then transfer them onto your device in the normal way. We are working on allowing direct downloads to mobile devices but this is not possible in the current version of the platform. Sorry about the inconvenience! Did you know that Amelia Earhart built her own roller coaster before she was ten years old? And what do you suppose happened to her while she was exploring a spooky cave and sledding down a steep, icy hill? 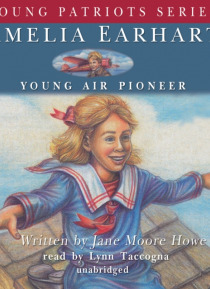 Find the answers and share all of Amelia Earhart's childhood adventures in this volume of the Young Patriots Series. Praised by parents, teachers, and historians, the Young Patriots Series is a… n ideal way to sweep today's young readers into history. The everyday details of family life, the time period in which they lived, what they wore, and the challenges they faced in school create a window through which children can access history. The early evidence of character, responsibility, ability, and courage are showcased in common situations to which every child can relate.